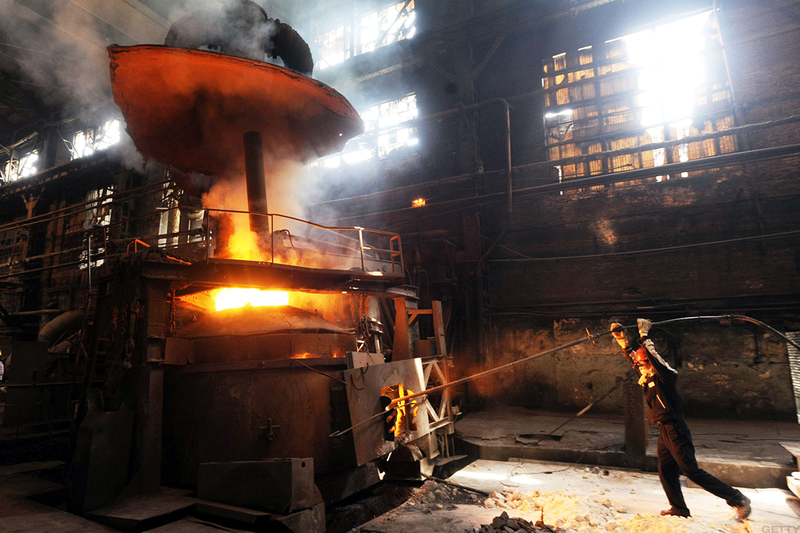 The price of steel will increase, driving these four stocks higher in the process. Here's what to own heading into the new year. Mining and metals stocks may not be as hot as tech or blockchain, but they're strong positions to hold moving into 2018, according to Credit Suisse analysts in a Dec. 21 note. Steel price momentum will continue on a positive trajectory into at least the first half of 2018, with the possibility of HRC testing the $675 to $700 per ton range. The implied 6.5% to 10.4% gain in price over the next six months will come as a result of higher scrap, seasonally stronger demand and lower imports, Credit Suisse said. A rosy outlook for steel prices should benefit the metals and mining sectors overall, analysts noted, given a strong correlation between commodity and equity in the space. Credit Suisse said it's also positive on downstream aluminum given strengthening aerospace sector fundamentals in 2018. The jet engine market is also ripe for gains as next generation models ramp up production and supply chain costs shrink. With that, Credit Suisse offered four suggestions for metals and mining stocks that will outperform the market in 2018. "AKS is our top pick in the Steel Industry as we believe the company should achieve material margin expansion in 2018, as contract price increases should more than offset recent pressure from raw materials. In our view, the market overly penalized AKS for weakness in 3Q-17 and poor communication around headwinds, but cash generation of the asset base remains strong. We believe investors will pay a higher multiple on FCF once contract prices reset and AK finalizes financing for its Precision Partners acquisition. We also see free option value on electrical steel as Section 232 remains a viable catalyst." "CSTM has established a track record of strong execution thus far on their roadmap towards more sustainable earnings growth and ROIC trends, driven by improved operational performance, more efficient capital spending, and leading industry positions in automotive sheet and aerospace plate/alloy. We believe the recent equity deal and updated target leverage of under 4.0x will broaden the appeal of the investment story and result in multiple accretion." "In our view, aerospace fundamentals should strengthen in 2018 as supply chain destocking fades. High incremental margins in jet engine products should drive solid earnings growth at ARNC, as the EPS segment volumes see step-function growth and start-up costs fade. We also see incoming CEO Chip Blankenship as a major positive catalyst." "We like Alcoa for its leverage to the aluminum market, which in our view is poised for higher prices in 2018, leading to strong earnings growth and FCF generation for AA. In addition, the recent amendment of its credit agreement will enable the company to return as much as $525mn to shareholders next year, and we expect AA to announce a dividend and/or buyback program as early as 1H18." Arconic is a holding in Jim Cramer's Action Alerts PLUS Charitable Trust Portfolio . Want to be alerted before Cramer buys or sells ARNC? Learn more now.